This bureau consists of a mahogany top leading down to a solid curl mahogany fall with moulded edge and large pierced brass escutcheon plate with original lock and key. The fall opens to reveal a superb fitted interior consisting of a central blind fret and inlaid door with original key leading down to a drawer in the form of tiled steps with inlaid starburst in mahogany and boxwood. The central door having a carved pilaster to either side and three arcaded achitectural form pigeon holes with brick effect, below the arches one mahogany and inlaid oak lined drawer leading down to two shaped mahogany and inlaid drawers all with brass knob handles. Below the fall having a looper to either side for the fall to rest on when open leading down to four graduated cockbeaded and oak lined drawers, each drawer with two pierced brass handles and central pierced brass escutcheon plates. 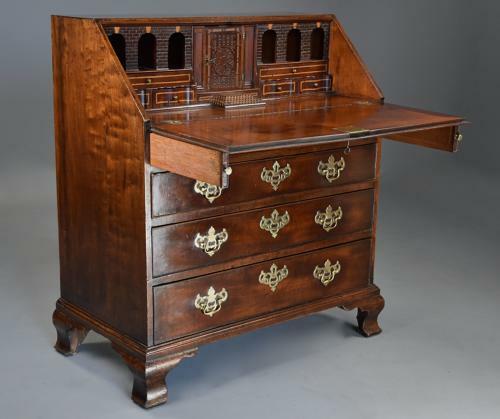 Below the drawers leading down to an applied moulding, the bureau supported on four shaped mahogany ogee feet. This bureau is in excellent condition for age, is of stable construction and can go straight into a home.